The Egyptian president Hosni Mubarak has issued a decree renewing the country's emergency laws for a further two years. The decision has led to criticism from political opponents and human rights groups, who say the laws stifle political freedom in the country. But the government says it has made significant changes to the laws, which have been in place for almost 30 years. The government has said they would only be used in terrorism or drug cases. Provisions allowing police to tap opposition supporters' phones, the censorship of the media and the confiscation of property would be removed, Minister for Legal Affairs Moufid Shehab said. The United States expressed disappointment at Egypt's decision to renew the emergency laws. White House spokesman Robert Gibbs said Egypt had missed an opportunity to embrace freedom of speech and of assembly. He urged the Egyptian government to move quickly to fulfil the promises it had made to its citizens. The laws were swiftly ratified by the the government-dominated parliament. There was a protest outside the People's Assembly in Cairo, which was surrounded by riot police. Demonstrations like these are sometimes tolerated by the government, but others have been broken up and protesters have been arrested or beaten up by police in recent weeks, correspondents say. There are Parliamentary elections due later this year and a Presidential vote due in 2011. President Mubarak's government says it is committed to political and social freedom. 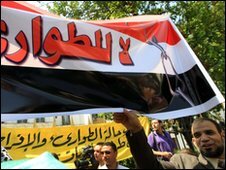 The BBC's Wyre Davies in Cairo says that many people are sceptical of the claims. There are some 10,000 people who remain detained without charge under the emergency legislation. The Egyptian government says it needs the laws to battle terrorism.